All you’ll need to start learning crochet is some yarn and a hook. In this guide I will cover the basics and show you how to learn crochet. Crochet is a needlecraft used to make fabric from yarn or thread. It uses a hook tipped needle to intertwine loops to form stitches. These stitches can create a wide variety of textured fabric, from basic solid forms to exquisite lace like patterns. Crochet is used to make traditional doilies, afghans/blankets, homewares, clothing & accessories, and even stuffed toys. Please help me by pinning below! You can crochet with any weight yarn and even thin thread, but it’s best to learn with some yarn that is readily available in your area. In the UK you will find the most common weight yarn is DK (Double Knit), whereas in the US, Worsted weight appears to be more popular. Don’t just pick the cheapest though, have a feel of it if you can, you want something that is soft and smooth rather than scratchy as some cheaper yarns can be. You don’t want to be put off from learning because the yarn gives you finger burn! Acrylic yarn is good for beginners, it’s soft and usually made of tightly spun plies that don’t split, which makes it easy to work with. Here are a few examples of acrylic yarn, as you can see, they do vary from brand to brand. Although they are all marked as DK weight acrylic yarn, they can differ significantly. On the left is a cheap yarn which I made the mistake of purchasing when I first started to learn crochet. I found it in a local independent discount store for £1 for a 100g ball. It’s 60% Acrylic/40% PP (Polypropylene) mix. I just thought yarn was yarn and didn’t know any better. I had no experience of purchasing yarn. When I picked up the ball of yarn it seemed soft enough, not that I had anything to compare it with, it was the only brand they had in the shop. While trying to use it I found, what looked to be fluffy fibres, to be very rough and scratchy (it was in the baby section, you’d think it would be soft!). So much so that it burnt my finger as it tried to glide through. If possible, try your yarn out by slipping a finger under a strand and gliding it across. It should slide easily without feeling like it’s cutting you. The middle is a ‘straight from the manufacturer’ yarn, priced a little higher than the first, at around £1.40 for 100g. It’s not a big name brand, you can only buy it from their own website in the UK. It’s 100% Acrylic. Compared to the first, it is not as frayed looking and you can see the strands clearer. It is a lot smoother and softer than the first, but it doesn’t hold up to unravelling too well; it flattens out once worked with, rather than bouncing back to shape. If you are on a tight budget, this would work fine. On the right is a known brand yarn, popular here in the UK. This yarn is marked as 100% Premium Acrylic and costs around £1.80 for 100g. You can see it is more uniformed and consistent than the others. The twists of the plies are clearly visible, smooth, almost shiny looking. Even though it’s the same yarn weight, it’s much fuller and bounces back. It is very easy to work with and glides through the fingers like silk. It is also forgiving if you make a mistake and need to unravel your work. I personally find this an important factor, as designing for Hooked On Patterns involves a lot of trial and error. This is just a guide to help you focus on what to look for when choosing, not a recommendation for a particular brand. Choices will vary depending on where you live, but you can look out for these details. They are usually even visible in photos, when shopping online. Avoid choosing a dark colour to learn crochet with, stick to something light or bright. You will soon learn that Black yarn is a crocheter’s nightmare! It will also be easier to use yarn that is one solid colour or with long colour changes, rather than variegated, to help you see your stitches clearly. Crochet hook sizes are determined by the diameter of its shaft, mainly in millimetres (mm). In the US you may find a letter gauge system being used, I find that they are not as accurate, but you should also be able to find the mm size marked as well. Hooks also come in different materials such as, metal, wood, or plastic. They also come in different handle types, some are straight, some have added handles made of a type of rubber, wood, or clay. There are 2 styles of croch et hooks, Inline and Tapered. These refer to the shape of the head and throat of the hook. Inline hooks have the same width from shaft to head, with a notch cut into it which forms the hook and comes to a point at the end. With Tapered hooks, the shaft tapers evenly around to form the throat, and then the head hooks over at the end. Choosing between these would be a matter of preference, but you’ll need to learn crochet first to decide which suits your style. You can try either to start with first, and if you want, you could try the other style to see if it’s more comfortable for you. Tapered hooks are generally more common with metal and plastic hooks, while wooden hooks tend to be Inline. It would be best to start with a plain straight hook, so you are free to decide on the holding style that suits you, as some handles can limit their use. Standard hooks are usually between 14-16cm (5.5-6.5”) long. There are longer ‘Tunisian’ hooks, but that is for a different style of crochet. Plain aluminium h ooks are a good starting point for learning crochet as they are smooth, light, and cheap. Wooden hooks can be rough and catch on yarn if not made or treated properly. Plastic hooks can snap and make an awful squeaking noise when working! You can browse a selection of hooks here: Lovecrochet. This is an affiliate link which helps me make some crochet patterns free to view. The hook size you need would depend on the yarn weight you use. For DK yarn it would usually be 4mm hook. For Worsted weight yarn it is usually a 5mm hook. You can check the information on the band of your yarn for a recommended mm hook size, sometimes it will just give the size for knitting needles but the size would be the same for a hook. Just these 2 items would be enough for learning and practicing crochet. If you want to try to complete a project while learning, you would also need a yarn needle and scissors to cut your yarn. Yarn needles are also known as darning or tapestry needles. They are large blunt needles with eye holes large enough for yarn to pass through. They can be made of plastic or metal, I like to use these ones: Lovecrochet. This is an affiliate link which helps me make some crochet patterns free to view. First of all, there are 2 different crochet “languages”, UK terms and US terms. 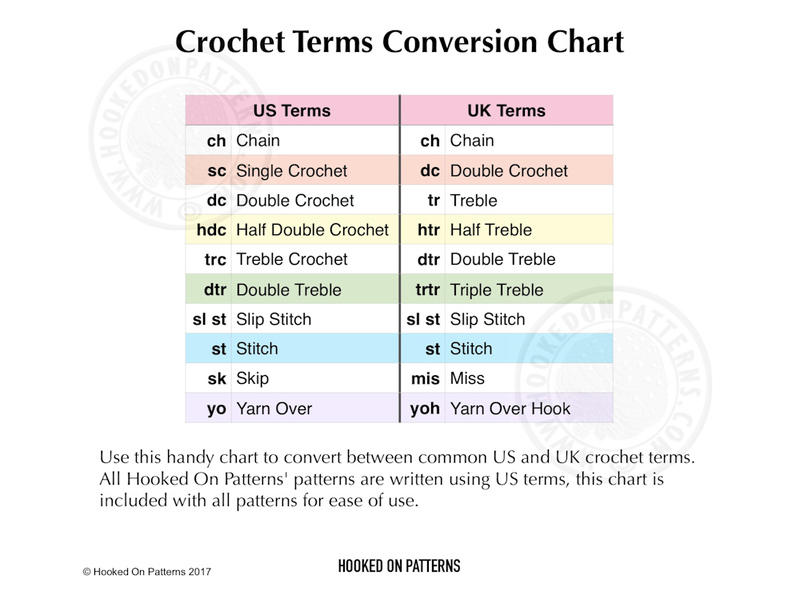 UK terms are mainly only used by some British and Australian crocheters, whereas, US terms are widely used throughout the world. It can be confusing as both use most of the same terms but mean different stitches. The difference is one stitch step. What the US terms consider a Single Crochet is known as a Double Crochet in UK terms, and a US version of a Double Crochet is called Treble Crochet in UK terms and so on. You can take a look at our UK/US conversion chart of basic stitches for more examples here. You can use whichever you prefer, your location doesn’t have to determine the language you use. I am based in the UK but favour US terms. Just be aware that there is a difference, try to make sure you know which language is being used before starting a pattern. US terms are more universal when it comes to finding patterns, but many patterns will offer a conversion of some sort or you can easily convert them yourself once you get the hang of it. There are various different crochet techniques, for example, how you hold your hook (like a pencil or like a knife) or how you hold your yarn. This varies from person to person, there is no strict right or wrong way, it is all down to preference of the individual. Experiment with all the different styles you come across to see which you are most comfortable with. There are many different ways to learn crochet. I personally learnt from watching and following YouTube tutorials. There are so many crochet tutorial videos available, you are bound to find a tutor that suits you. If you don’t get on with one video, just click on another and try again. The great thing about videos is that you can pause and rewind to work at your own pace. The first step for crocheting is getting the yarn on to the hook. The basic way is by making a Slip Knot, so this can be your first search “crochet slip knot”. The natural progression would be the Chain Stitch. To start with, having not seen an actual physical piece of crochet in person, I found it difficult to tell whether I was getting it right. I had tried working some Single Crochets at first, but wasn’t sure if it looked the same as the video. It was hard to compare against the limited resolution of the video and I didn’t know what it should look like. I thought I’d try to make a common item instead; something that would look familiar to me. I learnt how to make a simple Granny Square. The image of a crochet granny square is widely recognised and it’s easy to search for a high quality image to compare with. I could tell straight away when my first attempts didn’t look right, so I could undo it and start again. This also helped me with adjusting my yarn tension, as I could tell if it was too tight or loose by the trickiness of making a Double Crochet stitch. Too loose and the yarn was flopping about making it hard to see what I was doing, too tight made it difficult to twist around to get the hook in to place. When I manage to hit optimum tension, making the stitch was effortless. The right tension also formed a perfect square shape for my granny square. Once I understood the right tension, I was more confident in trying out the Single Crochets again and then other stitches after that. There are also many other online resources, like blogs and websites, which offer step by step tutorials for beginners and for learning new stitch formations. If you are on Facebook, you can find many crochet groups by typing in ‘crochet’ in the top search bar and click ‘see more results’ to find the ‘groups’ tab to filter them. Take a browse through them, select and read the ‘about’ section of the group to see if it appeals to you before requesting to ‘join group’. These groups are fantastic for connecting people from all around the world to form a community with a common interest. You will find inspiration, encouragement, advice, a place to share your accomplishments, and maybe a few great deals on yarn or patterns. The more members a group has, the more active it will be. Try something in the 5-15 thousand members range to start with, for a good amount of activity yet still be likely to be seen if you are to ask advice. You may find on larger groups, the page moves so fast that your post can be quickly lost. With some smaller groups, you may not be answered for hours or days. If you find you need more one on one guidance, you could see if there are any crochet classes held in your area. Or maybe there are knitting & crochet groups near you, where crafters gather and learn from each other. A great place to find out is at your local yarn shop, they often hold these in the shop or others would advertise their services/groups there. You could also try a general internet search, like ‘crochet classes near *location*’ or ‘craft group’. If you would like to try a slower pace, or maybe you don’t have reliable internet connection, you could try books. There are many different ‘learn to crochet’ books available to purchase from most book retailers or yarn shops. If you’re not sure if you want to invest too much money in crocheting yet, you could also try searching your local library and just borrow a book. Once you have learnt the basics, you will probably want to learn how to read patterns. I taught myself to read crochet patterns by following YouTube videos which have the written patterns along the bottom of the screen. Once I got comfortable with the terms and abbreviations used in crochet, I tried following some of these videos with the sound off. This way I would have to read the instructions but still have a visual example to help build confidence. There are many styles of crochet patterns, they will follow a basic structure of each line consisting of: row/round number, abbreviated instructions, followed by the total stitch count for that row/round. Some will be harder to follow than others, but don’t let that discourage you. I find that free crochet patterns found on yarn brand websites are usually solid blocks of text, which are quite difficult to follow. Independent designers on blogs will usually have photos that make them easier to understand. Personally, I include plenty of photos in each of my crochet patterns to make them easy to follow, and offer full pattern support if you find anything too tricky. Even once you have mastered the basics, you’ll find that there is always more to learn. The possibilities seem endless, you’ll always come across something new that’ll inspire you. I hope you have found our guide on How To Learn Crochet helpful. Once you’re confident with crochet, why not try selling your makes at a Craft Fair? You can find our article, offering tips and tricks, here. Have fun! Before you go please help me by pinning my pin from above! Thank you! I just started crocheting I found out that practice and videos helped me that best . so, I was wondering for a newbie want to make a baby blanket whats the best stitch . I know single & Double crochet . also best hook I have Caron Cakes & Baby Bernat . By already knowing Single and Double crochet stitches, you are ready to try most blanket stitch combinations! Unfortunately, I haven’t gotten around to making a baby blanket pattern yet, but there are hundreds of “crochet baby blankets” available on YouTube. I’m not sure if you mean Bernat Baby Blanket yarn, or just Bernat Baby yarn. If it’s the blanket yarn, it would be Super Bulky weight so would suit a 8mm hook or larger. This would work up well with a simpler stitch pattern, maybe Moss stitch which is worked alternating sc and ch1 stitches. Barnat Baby yarn is a lot thinner, using a 3-4mm hook, maybe not very suited to blankets. Caron Cake yarns are Worsted weight so a 5mm hook would be suitable. Working these long colour change yarns in the round can give fun effects. Maybe you could try a “crochet star blanket” with this yarn, there are lots of tutorial videos available. You can choose how many points the star has too! They can range from 5 to 12 points. Thank you for your comment, I’m glad you found it useful. A little tip for making Amigurumi, instead of buying toy stuffing, you can use the inside of basic pillows which is often cheaper! Once you’ve learned the basics, do come back and check out our Free Patterns section where we currently have a fun selection of Amigurmi items to try out.